high school and college graduates; it makes a wonderful gift and preserves memories while being used as a throw they can take with them. 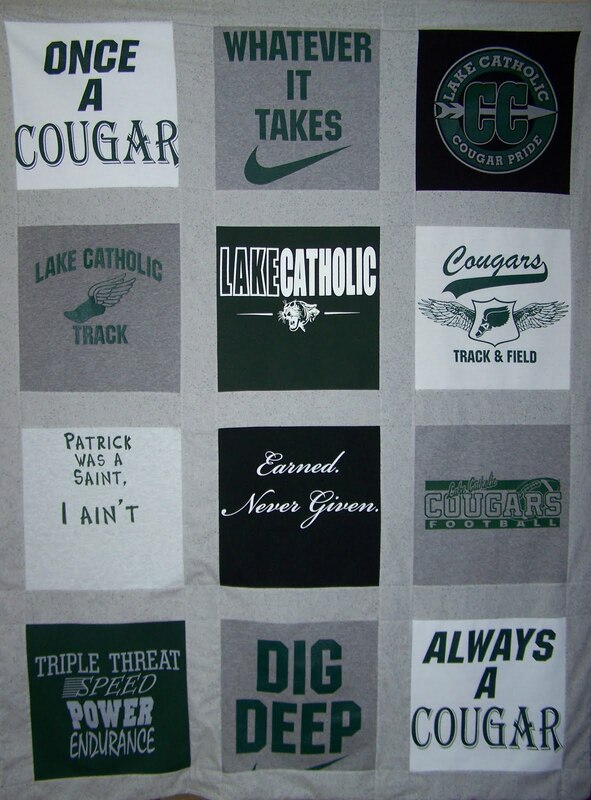 use as a stadium blanket; save up your favorite sports-themed T-shirts. turning your husband’s or student’s giant T-shirt collection into a comfy throw. preserving memories of a loved one. eliminating storage of T-shirts without eliminating the memories. 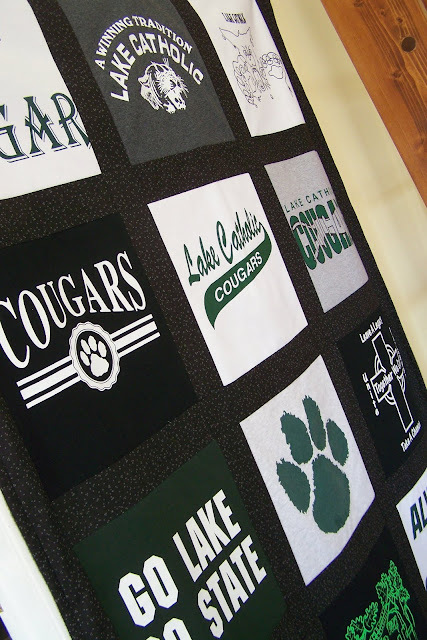 This quilt is a handmade gift that you will want to make time and again. I have made dozens and have developed this pattern and the most straight-forward method to achieve quality results. The finished size of the quilt is approximately 4′ x 5′ and the pattern is written for a beginner/intermediate sewer. I have only recently started photographing my finished quilts. As soon as they are finished they are given away. I have made all but one of my nieces and nephews a quilt as they graduated high school. (You’ll see a lot of Catholic schools in theses photos because tradition runs strong in my family!) 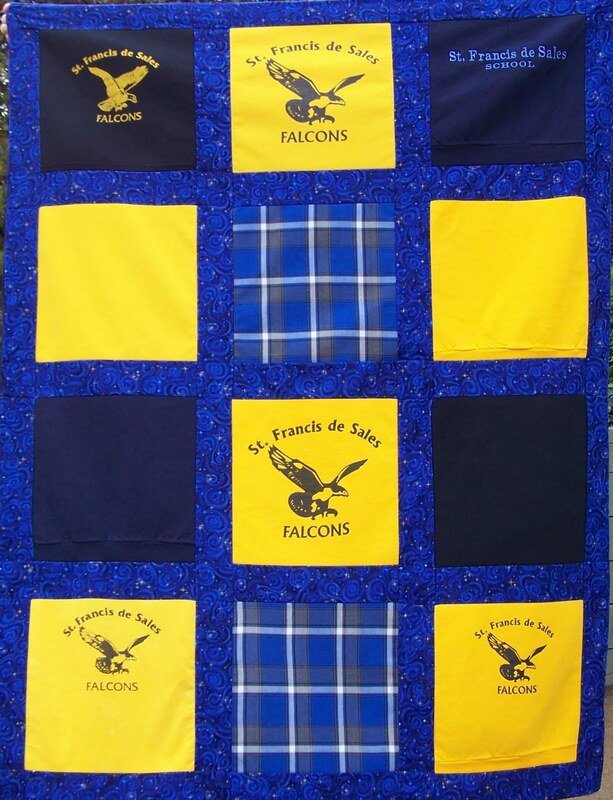 I have also made quilts for the children of friends. 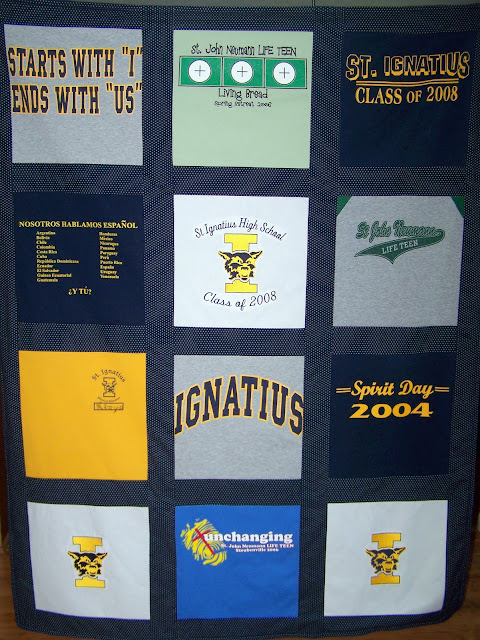 Most of the quilts I have made have been for high school grads. One quilt, however, was made for the brother of a boy who was killed in a tragic accident. The boy was 12, the same age as my son at the time. With each stitch, my heart broke, thinking of those poor parents and little brother. 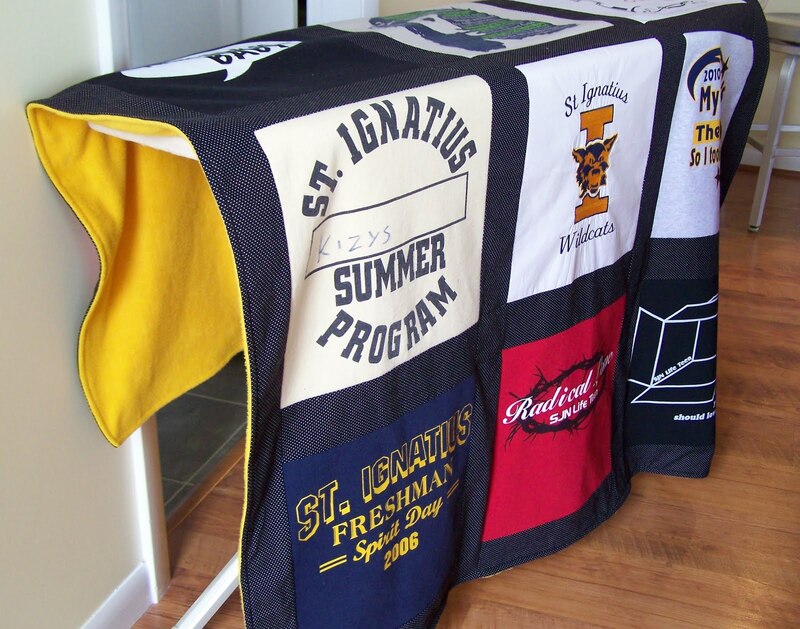 It was my hope that the quilt, made with old T-shirts and clothes, would be like wrapping memories around the younger brother. If you look closely you can see I’ve used tank tops and placket shirts. Anything goes as long as I can fit in in my square! 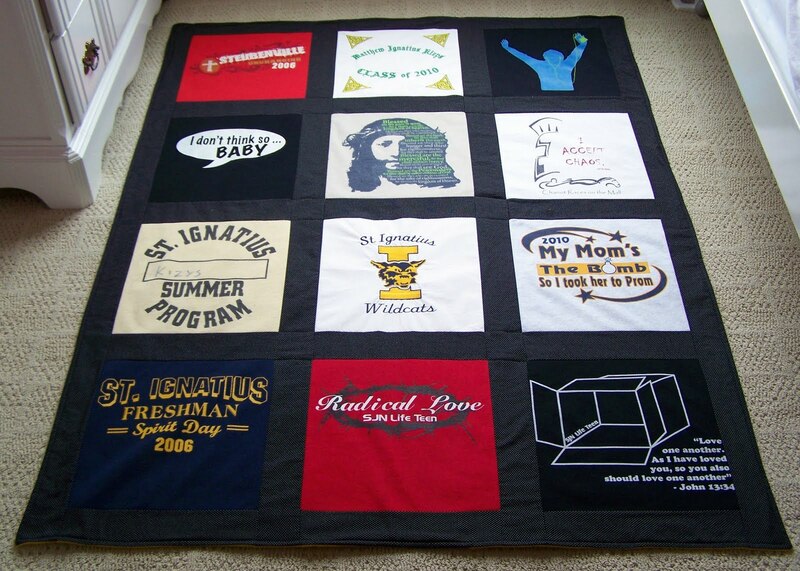 I make these quilts for customers via word-of-mouth. If any of you might be interested in having me make a quilt for you, please contact me. I want to keep the contest simple. The prize: one T-Shirt Memory Quilt Pattern, PDF format. To enter: please follow my blog via subscription/reader/follow and leave me a comment, as well as a way to reach you if it is not in your profile. Winner will be selected at the end of of May 9th, Mother’s Day and will be notified by email. If you want to blog, tweet, Facebook to spread the word, that would be nice, but not required. These are lovely quilts. I took a class and made one last year. It was very complex and I didn’t get a pattern for it. I would love a chance to win this pattern. Congrats and thanks. YAY! I sooo want this pattern! Will you be selling it on Etsy after the contest is over?? I want to make some of these for my son and brother. Dad recently passed suddenly and I have no clue how to do this. If I’m not the winner please let meknow where I can purchase this pattern or if I can now. Thank you for sharing your talents. That’s so cool! A great gift for a college-bound kid. I’d love to win a copy of your pattern…and I do subscribe to your blog! P.S. I have featured this post on my blog for my Sunday Linky Love meme…come check it out! This is an absolutely beautiful idea! 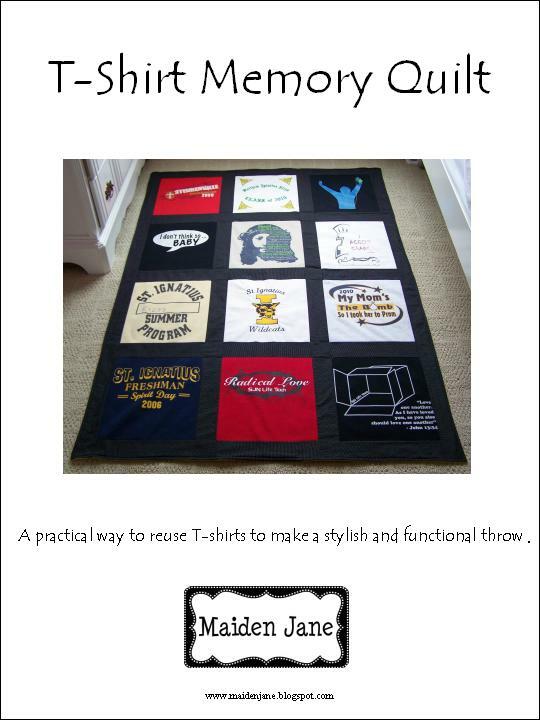 I have shirts from my father who passed away & this would be a wonderful way to wrap myself in his love & memories. I am so happy to have found you today! I am now following your blog. I would love to learn how to make one of these wonderful quilts from your tutorial. These quilts are great and I love the sentimentality in each one. Definitely the perfect grad gift! I’ve been planning to do something along this line for my husband. It would be wonderful to win a tried and true pattern! I’ve subscribed. Thanks! Congratulations on the big accomplishment! I know full well what a time-consuming task it is to write a pattern. Way to go! The photos look fab and I am excited to dig in and look at the pattern. 🙂 Yay for you! She has been married for sixteen years and the last I saw of it the backing was worn out from washing. Thank goodness the batting was an old blanket because she still uses it. She does not sew and throws everything in the washer. I would love to know how to really make one. I have grandchildren who would love them. This is really cool! I just followed your blog…I have so many nieces and nephews that would get a kick out of this. Having the pattern will be great for when my kids are all grown too! I love these quilts! 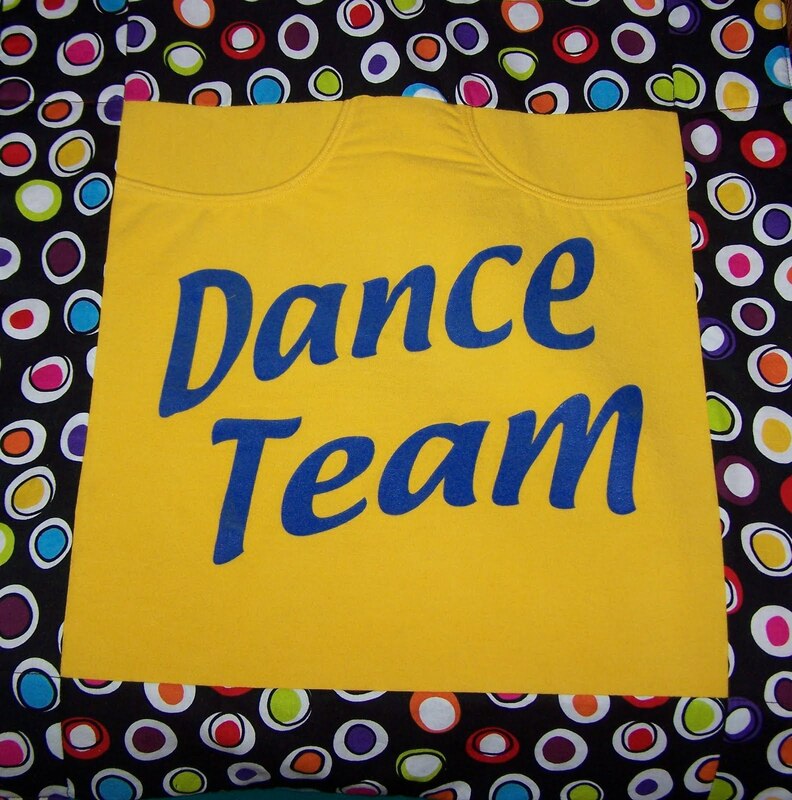 I would love to make one for my kids of some of their shirts they have outgrown! 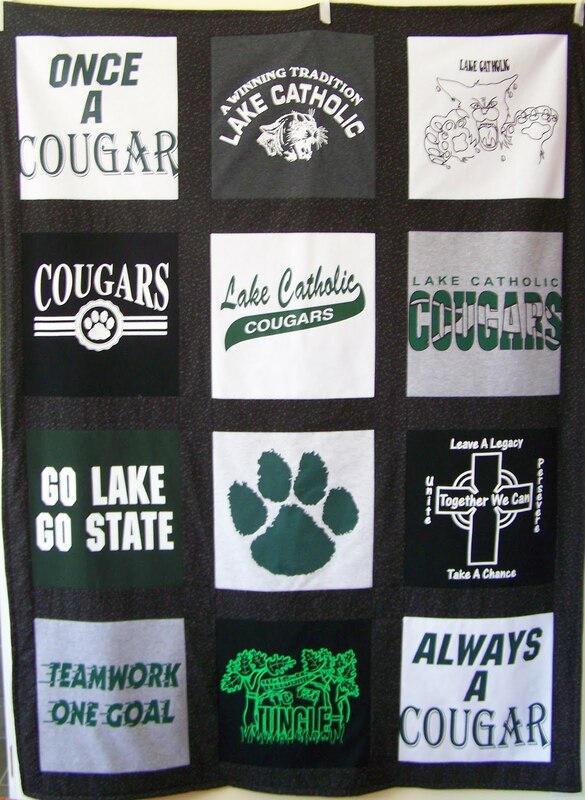 cool quilt. i’d love to try the pattern. signed up to follow your blog. 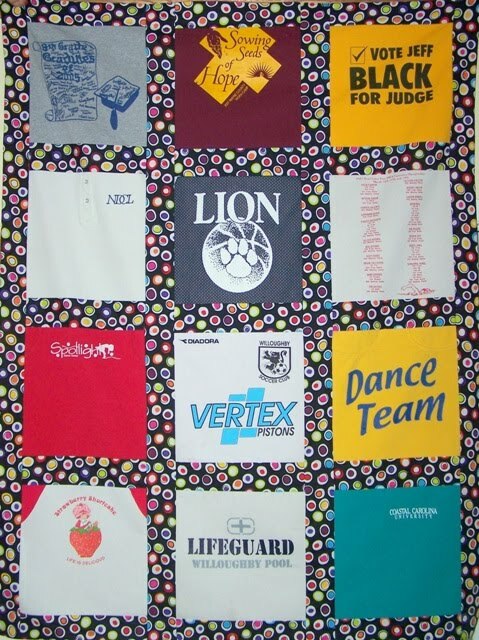 I’ve always wanted to make a t-shirt quilt from shirts of our local river festival that has been going on for over 30 years and draws over 100,000 people for many events that extend over 8-10 days in May each year. You do nice work and have a good eye for matching. Thanks for sharing. I follow your blog. I love this idea. My husband saved several after his dad died that he would like me to make into some sort of quilt. This would be perfect. Awesome quilts, what a great memento idea! This is a great pattern. I’ve got t-shirts coming out of everywhere and would love any and all ideas on how I could use them to make something else! Love to be the winner of this pattern. 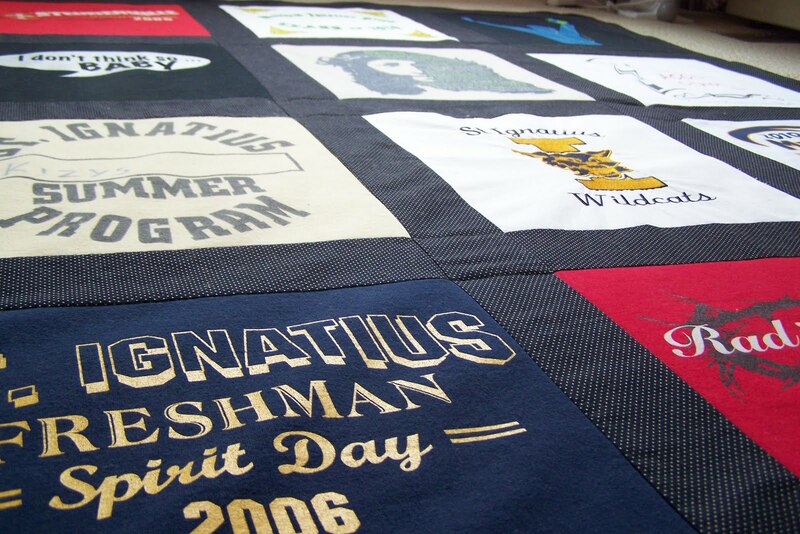 Your quilts are beautifully done. I have T-shirts from son, daughter, hubby and myself just waiting for the right pattern and this is it. I follow you on Google Reader. Jane, these are SEW awesome! I really love the memories aspect of the project… Yea on your first pattern, good job!!!! I’d love to try the pattern! This is exactly what I’ve been looking for. 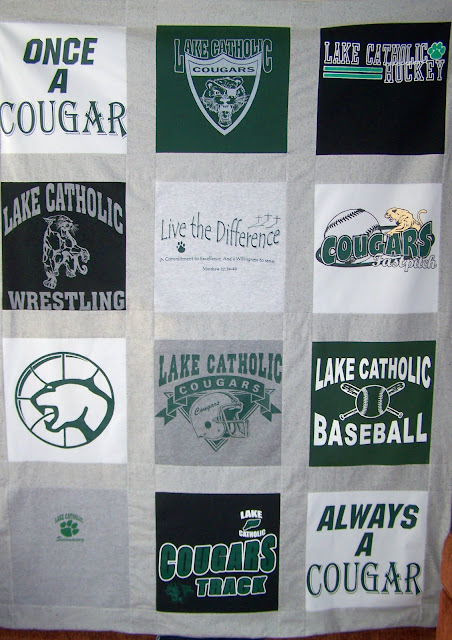 I have started collecting my grandson’s baseball shirts and would love to be able to make him a quilt before he gradulates high school – which he is only 11 now – so that gives me about 6 years. I too have tons of high school t-shirts for my Son and Daughter. high school plays and teams they helped manage. Your pattern looks terrific! What a fantastic idea, my husband has numerous t-shirts that don’t fit or to worn to wear and this would be a great gift for him. I follow you with google friend connect. Wonderful! I made one of these a few years ago for my brother-in-law. I did it without a pattern and it didn’t turn as good as I would have liked. I would love this pattern!! i am now a follower, i am such a hoarder so this is so the way to utilize all of the kid’s clothes that don’t sell on eBay that it is!!!! I’m such a sentimental girl!!! I’ve seen your giveaway advertised in several places. Imagine my surprise when I hop over here and recognize all the high schools in those quilts! You (or the recipients) must live nearby (Suburban Cleveland)! i just hope to one day make a quilt, period! these are great. i have a friend who also doesn’t take photos of her finished quilts before giving them away. they’re such an artform that i don’t know how one can not take a pic!